← Interest Rate Prediction For The Next 6 Months! Should Sellers Balk When they Receive An FHA or VA Contract? Over the last few weeks I’ve had a few sellers balk at receiving an FHA contract and a VA contract. In both instances I had to reassure the agents to communicate to the sellers that the borrowers were strong and that there is basically little difference in an FHA or VA loan compared to a conventional loan as far as speed and difficulty. Below I break down the 3 different types of loans in terms of processing times and the appraisals. Processing and closing times: Basically, there is little to no difference in how long it takes to process and close a conventional loan compared to an FHA or VA loan. All 3 types of loans are underwritten and closed by the lender and do not have to go to FHA or VA to be processed or underwritten. When sellers complain that they do not want to accept an FHA or VA loan because it takes longer to close, let them know it is just not true. Also, all 3 loans use computerized underwriting modules. Once the loan is approved by the underwriting module then it is up to the lender to gather the conditions. 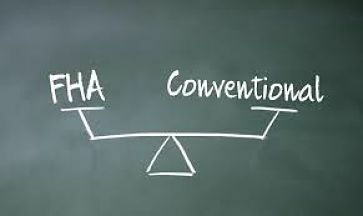 The FHA and VA conditions are no harder to obtain than the conventional conditions. If the processing and closing time are taking forever then blame the lender, not the program. Appraisals: As far as value, all 3 programs use basically the same criteria to obtain their values. It will be based on past sales that are similar to the actual home being sold. The same appraiser will get the same value under all 3 programs. Different appraisers might get different values on the same home but not because it was an FHA or VA compared to a conventional. It will be because one appraiser used a different comparable or used a different adjustment than the other appraiser used. The only real difference you will see in the appraisals under the 3 different programs will be that FHA is a bit more strict when it comes to detail. FHA has to check to see that all the mechanicals and kitchen appliances are working and has to inspect the attic and crawl spaces. Plus for homes built prior to 1978 they need to check for chipping and peeling paint. That doesn’t mean that a conventional appraiser will not point these items out but an FHA appraiser has to. So to recap. If you are an agent then let your sellers know that there is little to no difference in an FHA or VA loan compared to a conventional loan. And if you are selling a home don’t be concerned about the type of loan in the contract, be concerned about what mortgage lender the borrowers are using. The lender is much more important to the speed of the transaction and getting to the closing table than the program being used. Great info! I’m going to share with some clients. thanks for the review & sending it out. I have misplaced Kim Casteen’s phone #; could you send it to me?